Hiring managers see a lot of resumes pass over their desk, so you need to create a document that stands out from the rest. Recruiters want to see candidates whose skills, accomplishments, and experiences fit the job at hand. To achieve this, your document needs to be easy to read and tailored to the specific job you’re applying to. Because you need to focus on both format and content, the entire crafting process can easily overwhelm. If you’re feeling stressed out by the idea of writing a resume, you can make the process a little easier by turning to our free printable resume templates and writing tips. Using templates means you can create a document with a flawless design that emphasizes your most impressive traits. Find out how to write a resume and wow employers by reading on. Why Use Free Printable Resume Templates? As you set out to get a new job, you might not realize that hiring managers spend an average of only six seconds looking over resumes before deciding if they want to learn more about the candidates. This means your file has to emphasize readability if you want to succeed. Resume templates make it easy for you to craft a standout document on your first try. Whether you’re a stay-at-home mom ready to return to work or a recent grad excited for your first job, you need to find a resume design that emphasizes your skills over your experience. Traditional chronological formats may illuminate your lack of experience or job gaps. A functional layout, on the other hand, focuses more on what you’re good at and less on what you’ve done. 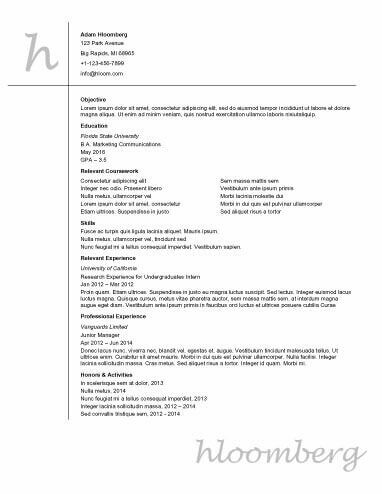 Creative resumes use unique layouts, color schemes, and graphics to make a resume stand out. This bold format doesn’t work for everyone, but it may prove successful for people in marketing, fashion, graphic design, or theater. Before you customize creative free printable resume templates, think about who will read the document. Make sure your resume matches the company’s tone, whether that is conservative or contemporary. One element that sets professional resume templates apart from the rest is their clean and simple layout. If you want to incorporate a minimalist format, these free printable resume templates may interest you. This style template works well for anyone who works in an old-fashioned or conservative industry. Even people in creative industries may use a professional layout to ensure their document makes it past the applicant tracking system. Another great pool of free printable resume templates for someone in a more conservative career would include classic, basic formats. These classic resumes use white space, basic fonts, and simple embellishments to create a document full of universal appeal. You can find templates that use chronological, functional, or combination layouts to ensure you emphasize your most impressive feature. Our huge selection of free printable resume templates means you can find a design you love. If you don’t have time to sift through all of the options, check out our most tried and true formats. This selection includes some of our best, most-used files, which means you’ll find something that will appeal to almost any hiring manager. After you have found the perfect resume template, you need to make sure you know what to say. Some writers choose to think about what they want to say before looking through our free printable resume templates because this allows them to pick a format that will best complement their information. The details in your document should be unique to you and your experience. However, you can get ideas on information to include by looking through industry-specific examples. You might even find some inspiration for phrasing and order. Some details hiring managers expect to see in every resume, while others are optional. For example, if you have impressive awards and accolades, you can either create a separate section or include the awards under the appropriate job experience. Recruiters don’t expect to see an awards section, but they might find it intriguing if there is one! Remember, resumes don’t have to include every single detail of your professional history. In fact, you want to keep this document short and concise. Make sure you cut out any information that is not directly pertinent to the job you’re trying to get. The job search can lead to stress and anxiety. These difficulties may start as soon as you sit down to craft the first draft of your resume. Using free printable resume templates or a resume builder not only makes the writing process easier, but these tools can even help you cut back on your stress. Why do so many jobseekers use resume builders? When you’re ready to successfully go for a job, you need to make sure you have the best tools at your disposal. An outstanding resume can make it easier for you to land a job interview.